It's no secret that Minecraft‘s [$6.99] true intention is to be present everywhere, and the latest endeavor is another step in that direction. As announced recently, Mojang is working together with Egmont to publish an all new Minecraft: Official Magazine, which will exist in physical form. The magazine is already out in the UK and will be traveling to another countries “as soon as logistically possible.” The new magazine is 60-pages long and filled with all kinds of tips, tricks, survival stories, and much more. The tips and tricks part contains various builds broken down into detailed steps to help readers figure out how to improve their skills. In addition to the aforementioned sections, the new magazine also contains a comic starring new heroes, Bear, Scout, Sparks, and Monty. As you'd expect from a Minecraft comic, these characters each represent a segment of the Minecraft player base. You have a survivalist, a warrior, a builder, and an explorer. 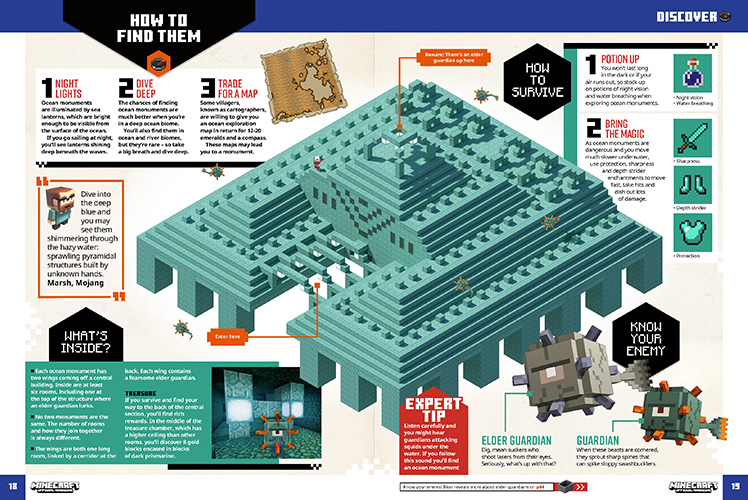 I continue to be pleasantly surprised by all that comes out of the Minecraft universe, and I think this magazine is going to be another big hit with the game's players. Expect it to hit the US shores in the not-to-distant future.